You are here: Home / Communities / Rehoboth DE Homes For Sale / The Seasons Rehoboth! Still selling! 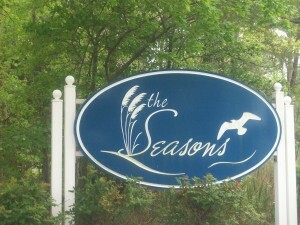 The Seasons- Rehoboth’s Newer Community a slow Start! The Seasons – Rehoboths newer neighborhoods of Rehoboth Beach. The community went through a real slow start. The Seasons Rehoboths offers single family homes, carriage homes, and townhouses. The community next to The Seasons started construction way after The Seasons and finished all construction due to its high pricing. The community is located amid peaceful and relaxing surroundings, with the Rehoboth Beach Yacht and Country Club located next door and views that overlook the Kings Creek Golf Course. The community itself offers many of its own attractions, including a scenic pond and a swimming pool for community use. Although Rehoboth Beach can get busy and become somewhat overrun by tourists in the summer months, residents of The Seasons are shielded from the crowds thanks to the fact that they live in a limited access community where only residents are typically permitted. The Seasons Rehoboth Price Drops attract buyers! However a Realtor can save you $$$! Further afield, residents of The Seasons Rehoboths can reach the beach or the Rehoboth Boardwalk within minutes. Also, Dewey Beach and Cape Henlopen State Park are also easily reached from the neighborhood. It’s worth noting that both Rehoboth Beach and Dewey Beach have been hailed as some of the cleanest beaches located in the entire United States. Other area amusements include miniature golfing, and Jungle Jim’s water park is a great place for young families. Residents who enjoy the outdoors and water sports will find no end of amusements, including opportunities for fishing, crabbing, snorkeling, hiking, jet skiing, surfing, sailing, and more. Rehoboth Beach also features night life options including many different restaurants offering diverse cuisines and night clubs. Rehoboth Beach and The Seasons offer more than simply recreational opportunities. The schools around the area are known as providing a high quality education and rating well in comparison with schools in the United States overall. Both Beacon Middle School and Rehoboth Elementary School are located within two miles of The Seasons Rehoboths. Cape Henlopen High School of the Cape Henlopen School District is found within four miles of The Seasons on Kings Highway in Lewes. Universities located nearby include Salisbury University and the Delaware State University in Dover.